Well, the big event on my blog this year was the release of Mastering Genealogical Proof by Thomas W. Jones and the accompanying Gen Proof Study Groups. The posts about the book and the study groups were three of the most popular posts on this blog in 2013. This is fitting, as I think this book is excellent and one of the best genealogical education tools available this year. Two of the other most popular posts were about the Virtual Genealogy Fair at the National Archives, and Preparing for a Research Trip to Washington, D.C. The National Archives and Federal records are among my areas of specialization, and I think I will write more about them in 2014. I will also write more about my favorite genealogy educational opportunities for 2014 tomorrow. Preparing for a Research Trip to Washington D.C. I am excited about the announcement of the 2014 Legacy Family Tree Webinar Series. I have participated in a number of the previous webinars and find them to be an excellent learning opportunity. These webinars are free if you watch them live, or for the first seven days. There is also a membership if you want access to all the webinars at your convenience. Millennia Corporation and FamilyTreeWebinars.com are pleased to announce that registration is now open for its 2014 Legacy Family Tree Webinar Series. Choose from 52 classes from genealogy's leading educators (nearly 80 hours of free genealogy education) on topics ranging from genealogy technology to in-depth research methodologies and evidence analysis. Legacy Family Tree Webinars was awarded the Best Genealogy Education or Learning Experience by the About.com 2013 Genealogy Readers' Choice Awards. Sign up for one or for all of them today (so you don't forget later) and you will receive a reminder email both one day and one hours prior to the live event. Brand new - sign up for multiple webinars at the same time by clicking here or visit www.FamilyTreeWebinars.com. All live webinars are free, and their recordings are free to watch for the next 7 days. If you missed a previous webinar you can now have access to the entire archives (now more than 200 hours) and instructors' handouts (more than 500 pages) through a monthly or annual webinar membership. Click here for more information or to subscribe. See you online in 2014! Every year I get excited for the Institute of Genealogy and Historical Research. In my opinion it is one of the best genealogy education options available.There are ten courses to choose from and registration is set for Tuesday, January 21, 2014. Mark your calendars, as some courses will fill within minutes. In order to accommodate the high level of interest in this institute, there is a rolling system of opening registration for two courses at a time. This will begin at 11:00 a.m. Eastern time (10:00 a.m. Central, 9:00 a.m. Mountain, 8:00 a.m. Pacific). A link will be provided on the IGHR Registration page (http://www4.samford.edu/schools/ighr/IGHR_registration.html) to the online registration at that time. If this is your first time registering, or if you just want a refresher on what to expect, please consult the downloadable online registration guide (http://www4.samford.edu/schools/ighr/IGHR101_online-reg-2014.pdf). The Institute itself will take place on June 8-13, 2014. For more information, including the courses being offered and how to register on Jan. 21, visit the IGHR website at http://www4.samford.edu/schools/ighr/. IMPORTANT NOTE: Advanced Methodology and Evidence Analysis (formerly Course 4) will not be offered in 2014. For more information about this and other changes see the IGHR homepage at http://www4.samford.edu/schools/ighr/index.html. As a member of the National Institute on Genealogical Research Alumni Association (NIGRAA) I am excited to let you know about a scholarship available to attend the institute. I attended in 2008 and have loved working with federal records ever since. Beverly Rice, the current president of NIGRAA, has asked me to publicize this scholarship. Apply quickly if you are interested, as the deadline is January 15, 2014. The National Institute on Genealogical Research Alumni Association (NIGRAA) announces the Richard S. Lackey Memorial Scholarship for 2014. This scholarship is awarded to an experienced researcher employed in a paid or volunteer position in the services of the genealogical community. The amount of the Scholarship is $500, which covers full tuition for the National Institute on Genealogical Research, attendance at the Alumni Association Dinner, and will partly defray hotel and/or meal costs. Applications must be submitted in PDF or Word format. The completed application form and attachments should be e-mailed to Beverly Rice at and received by 15 January 2014. The application form can be found at the bottom of the NIGRAA website at http://www.rootsweb.ancestry.com/~nigraa/. The winner will be notified no later than 15 February 2013. The scholarship winner will automatically be accepted for the National Institute on Genealogical Research (NIGR), to be held at the National Archives in Washington, D.C., from Monday, July 14 through Friday, July 18, 2013. NIGR is an intensive program offering on-site examination of federal records and is intended for experienced genealogical researchers. Note: an application to attend in 2014 must also be submitted to NIGR. Membership in NIGRAA is open to anyone who has completed one or more sessions of the National Institute on Genealogical Research or who has lectured at any session. If you are interested in the Professional Management Conference (PMC) hosted by the Association of Professional Genealogists (APG), but are unable to travel to Salt Lake City in January, you may like to participate virtually. Thanks to Family Search, five of the sessions on Saturday, January 11, 2014 will be available for live streaming. Visit www.apgen.org/members/2014virtualpmc.html to register for the Virtual PMC and to view class times. Registration for the Virtual PMC closes on 6 January 2014. This option includes live access to all 5 Virtual PMC classes on Saturday, 11 January 2014, a downloadable PDF of the full conference syllabus, and 3 months of access to recordings of all 5 sessions. Register to view recordings of individual sessions you're interested in and receive 3 months of access to online recordings of individual sessions and syllabus materials for the individual classes. Would you like to participate in person? The PMC will be held 10-11 January 2014 at the Radisson Hotel in downtown Salt Lake City. Prices begin at $50 for Friday's classes. Early-bird registration and pricing ends 6 January 2014. Register for the PMC and view full pricing details at www.apgen.org/conferences. "The revision is both longer and shorter. Five appendixes (86 pages) in the 2000 edition show examples of different kinds of genealogical compilations and reports, all fictitious. The 2014 edition replaces that section with a 3-page list of online and print resources for non-fictitious examples. The new edition also contains a 17-page glossary, which the prior edition does not have. Not only does the newer edition have fewer pages, they are smaller in size. The font size is not smaller. The new edition's 83 standards fill 41 pages, where the earlier edition's 72 standards fill 25 larger pages. The standards in both editions cover the same principles, but they are reorganized in the new edition, as well as updated to reflect relevant advances in technology and science since 1999. The reorganization includes separating multi-part standards, combining related concepts into one standard (thus minimizing repetition and redundancy), and grouping standards to reflect more clearly the structure of the genealogy discipline's skill set. Each standard now bears a title/descriptor. The new edition aims for greater clarity, stronger connections to genealogists and their work, and closer ties to the Genealogical Proof Standard. Watch the Website for charts showing the correspondence between the two editions' standards numbers." SAVE 20%! To place a specially-priced, pre-publication order with delivery in the first part of February 2014, visit http://www.bcgcertification.org/catalog/index.html. Regularly priced at $14.95, the pre-publication price is $11.95 before January 27, 2014. I was excited to hear this morning that the Board for Certification of Genealogists (BCG) is releasing Genealogy Standards, an updated edition of The BCG Genealogical Standards Manual (2000). This new manual is issued in honor or the 50th anniversary of the Board for Certification of Genealogists. * continuing education (standards 82 & 83). The 100-page book includes appendices: the genealogist's code, a description of BCG and its work, a list of sources and resources where examples of work that meets standards are regularly published, a glossary, and an evidence-process map distinguishing the three kinds of sources, information, and evidence. Board for Certification of Genealogists. 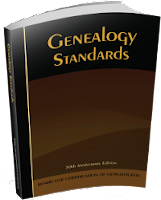 Genealogy Standards, 50th anniversary edition. New York: Turner Publishing Co., 2014. 100 pp., paper, ISBN 978-1-63026-018-7, $14.95.